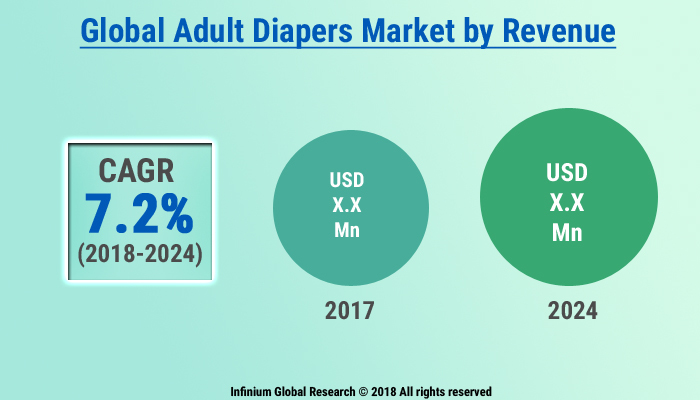 A recent report published by Infinium Global Research on adult diapers market provides in-depth analysis of segments and sub-segments in global as well as regional adult diapers market. The study also highlights the impact of drivers, restraints and macro indicators on the global and regional adult diapers market over the short term as well as long term. The report is a comprehensive presentation of trends, forecast and dollar values of global adult diapers market. According to the report, the global adult diapers market is projected to grow at a CAGR of 7.2% over the forecast period of 2018-2024. An adult diaper or adult nappy is worn by a person with a body larger than that of an infant or toddler. These diapers can be necessary for adults with various conditions, such as incontinence, mobility impairment, severe diarrhea or dementia. These are available in various forms, including those resembling traditional child diapers, underpants, and pads resembling sanitary napkins (known as incontinence pads). On the basis of region, the Global Adult diaper market is segmented into North America, Europe, Asia, and the Rest of the World (RoW). North America dominates the global Adult Diaper market. Asia Pacific region is expected to grow at the highest CAGR during the forecast period, 2018-2024 due to growing disposable income among adult but lack of time for their old parents, changing family structure, lack of availability of caretaker for the aged person and during long traveling for the aged person are some of the factors driving the market in this region. The report on global adult diapers market covers segments such as product. On the basis of product, the global adult diapers market is categorized into pad type, pants type, and flat type. The report provides profiles of the companies in the global adult diapers market such as DSG International, Covidien, First Quality Enterprises, Inc, Daio Paper, Hengan Group, Fu Burg Industrial, Medline Industries, Kao Corp., Nippon Paper Industries and Kimberly Clark. The report provides deep insights on demand forecasts, market trends, and micro and macro indicators. In addition, this report provides insights into the factors that are driving and restraining the global adult diapers market. Moreover, IGR-Growth Matrix analysis given in the report brings insight into the investment areas that existing or new market players can consider. The report provides insights into the market using analytical tools such as Porter's five forces analysis and DRO analysis of adult diapers market. Moreover, the study highlights current market trends and provides forecast from 2018-2024. We also have highlighted future trends in the adult diapers market that will impact the demand during the forecast period. Moreover, the competitive analysis given in each regional market brings insight into the market share of the leading players. This report will help manufacturers, suppliers, and distributors of the adult diapers market to understand the present and future trends in this market and formulate their strategies accordingly.